I found the following on ambient light sensor: Firefox won’t let me highlight the important stuff but the 4th paragraph captures the question. I hooked the PSU back up and tried to download and mount the temp monitor App. But only get about 10 minutes to work with the iMac before it shuts down. Darn it. Can I sub a 614-0326 with a Delta 614-0327 PSU ? Only $6.95 for the unit on the web. 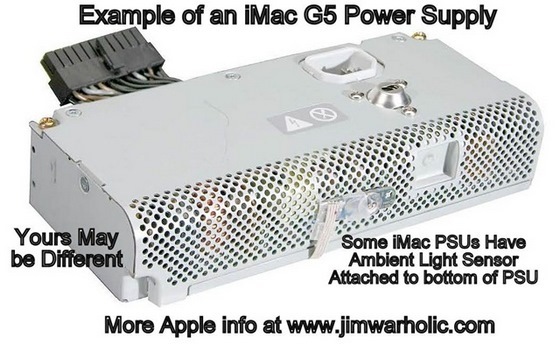 What are the differences between the second generation or “Ambient Light Sensor” iMac G5 models? Please note that the iMac G5 “Ambient Light Sensor” series was introduced on May 3, 2005 and discontinued October 12, 2005. Like the original iMac G5 systems, the “chassis” of the “Ambient Light Sensor” iMac G5 models rest upon an aluminum stand with an adjustable hinge, and it supports the “Video Electronics Standards Association (VESA) mounting interface standard” which makes it easy to mount the system directly on a kiosk, wall, or articulating arm. Additionally, as the name implies, all “Ambient Light Sensor” models have a sensor under the edge of the display that dims the sleep indicator light when the room is dark — a nice touch for a system setup in a bedroom. †These models have an ATI Radeon 9600 with 128 MB of DDR SDRAM. ††All hard drives are 7200 RPM. *AirPort Extreme (802.11g) and Bluetooth 2.0+EDR pre-installed. I have a iMac A1058 with troubles of rare graphics on video and shutdown automatic actions, searching info about this problem, I found your post about how to check the DC voltages on PSU, and AC ripple. My PSU appears to be fine, the only doubts is about on pin 9 (+5.1Vsb) with 4.99v instead of 5.1v, and pins 10, 13 and 19 (+12V) with 11.7v instead of 12v, this differences may be the cause of troubles on this iMac ??? @Lorenzo… While the voltages are close to what they should be, I would also check and verify the ripple voltage on the voltages themselves. I am not sure if you have actually measured the ripple. To do that, if you have a Digital Volt Meter, you can place the setting of the meter to AC voltage, and measure how much ripple is present on the DC voltage. For example, the AC ripple voltage on each of the DC voltage power supply levels should be in the low millivolt levels (less than .010 volts [10mV] AC). If you are getting upwards of .500 volts (500mV) AC ripple, then the capacitors could be faulty on the power supply itself. Note also, under load conditions, the ripple can climb exponentially. So if you were playing videos, then the power supply that is supplying the appropriate voltages for the video card could bog down (significantly dropping) the DC voltage and increase the ripple current, manifested by an AC ripple voltage on the DC voltage supply. Another point of understanding is that if the capacitors on the logic card or video card are bad, this can have the same affect of bad capacitors in the power supply, because it would be overloading the power supply in trying to maintain the proper voltage to whatever component areas onboard the circuit boards. Thanks for your quick response; I did measures of AC ripple with my oscilloscope and in all voltages don’t have ripple, the signal is totally flat on PSU; only I detected the 12V line a bit low (11.7V without load); about the capacitors on logic board, only one it had leaked and bulging (1000uf/16v) and they was replaced but all others looks like fine on working order although I don’t know if the capacitance and ESR is correct, I only checked one of 1800uF/6.3V that is near of the 1000uf caps group and it was measured good ( about 1920uf) and ESR is good. The iMac works power on but show strange graphics on the video screen, is locked and turn off by itself, about a one to two minutes; I don’t sure if processor fan works, all happens very quickly . What is you recommendation ???? I have to change all capacitors ??. It’s difficult to know for sure of what the problem is. Note that if one of the capacitors was bulging, it is likely that some of the other capacitors are bad even if they are not showing signs of bulging. However, given that some of the other capacitors are probably bad, there could be other things wrong besides that. Note that the PSU could be defective in other ways, which may be causing the shut down. Make sure all fans are functioning also. It could be that something is overheating and tripping out the over-temperature condition.